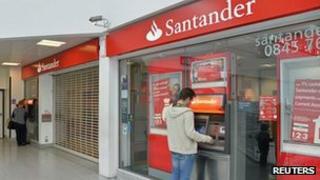 Four men have appeared in court over an alleged attempt to take control of computers at a Santander bank branch to steal millions of pounds. They were charged with conspiracy to steal after an incident at the Surrey Quays branch in south-east London. The cyber gang is alleged to have tried to use a "keyboard video mouse" to take control of all the branch's computers. Earlier, 12 men were arrested as addresses in Hounslow, Westminster and Slough were searched. Lanre Mullins-Abudu, 25, from Putney, south-west London, Dean Outram, 34, from north-west London, Akash Vaghela, 27, from Hounslow, west London, and Asad AliQureshi, 35, from south-west London, spoke only to confirm their names and details when they appeared at Westminster Magistrates' Court charged with conspiracy to steal. Eight other people have been bailed to a date in mid-November pending further inquiries.